Newfoundland and Labrador (NL) is home to a number of companies at the cutting edge of remote sensing technology. From mature, established organizations to specialty start-ups, the province is increasingly excelling in this high technology category. Rutter Inc. has spent more than 20 years developing a proprietary suite of radar technologies including its Sigma S6 system, which has helped it lay claim as the largest supplier of ice radar systems in the world. Its technology is largely used in the global oil and gas industry, with oil spill, and wave and ocean current monitoring added to its proprietary suite, along with small target monitoring utilized in other sectors such as homeland security. 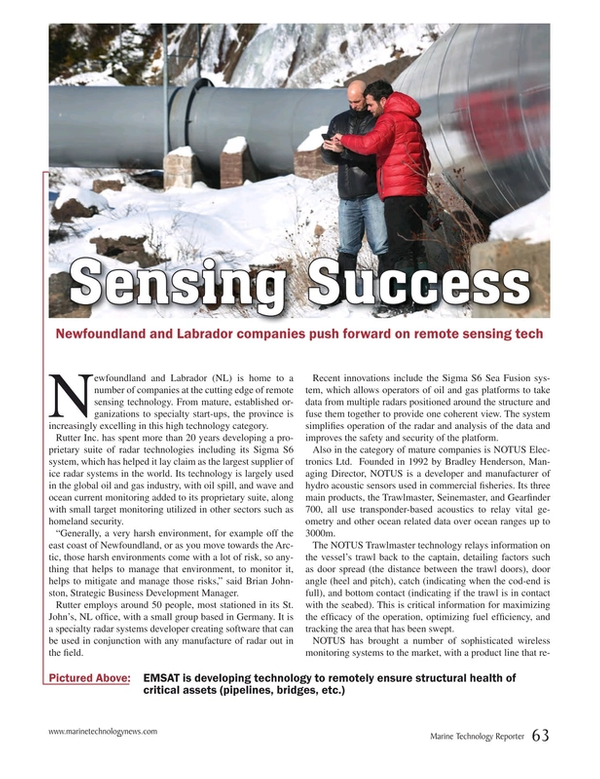 “Generally, a very harsh environment, for example off the east coast of Newfoundland, or as you move towards the Arctic, those harsh environments come with a lot of risk, so anything that helps to manage that environment, to monitor it, helps to mitigate and manage those risks,” said Brian Johnston, Strategic Business Development Manager. Rutter employs around 50 people, most stationed in its St. John’s, NL office, with a small group based in Germany. It is a specialty radar systems developer creating software that can be used in conjunction with any manufacture of radar out in the field. Recent innovations include the Sigma S6 Sea Fusion system, which allows operators of oil and gas platforms to take data from multiple radars positioned around the structure and fuse them together to provide one coherent view. The system simplifies operation of the radar and analysis of the data and improves the safety and security of the platform. Also in the category of mature companies is NOTUS Electronics Ltd. Founded in 1992 by Bradley Henderson, Managing Director, NOTUS is a developer and manufacturer of hydro acoustic sensors used in commercial fisheries. Its three main products, the Trawlmaster, Seinemaster, and Gearfinder 700, all use transponder-based acoustics to relay vital geometry and other ocean related data over ocean ranges up to 3000m. The NOTUS Trawlmaster technology relays information on the vessel’s trawl back to the captain, detailing factors such as door spread (the distance between the trawl doors), door angle (heel and pitch), catch (indicating when the cod-end is full), and bottom contact (indicating if the trawl is in contact with the seabed). This is critical information for maximizing the efficacy of the operation, optimizing fuel efficiency, and tracking the area that has been swept. NOTUS has brought a number of sophisticated wireless monitoring systems to the market, with a product line that remains affordable for all size and type of vessel. On the other end of the spectrum are some very new remote sensing technology companies. EMSAT, with a team composed of electrical and software engineers and environmental scientists, has developed real-time data monitoring software that is now being used as far afield as Brazil. Its technology advances enhance existing sensor technology used in offshore oil and gas and other ocean-related industries, helping decision-makers to derive data insight and provide information on critical parameters, introducing a large degree of automation (alerts and data reports) and intuitive back-end interfaces (data visualization and tailored dashboard). The dataset is diverse. EMSAT’s technology aids in the real time data processing of phenomena such as wave height, wave direction, ocean currents, and meteorological information such as wind speed, wind direction, and temperatures. Beyond environmental measurements, there is also a need for real-time data monitoring relating to integrity of a structure, vessel or piece of equipment. For example, EMSAT is partnering with Seaformatics that has produced a unique ocean sensor platform ‘pod’ that sits on the seabed and harvests power from ocean currents using a large turbine to provide long-term, real-time, wide-area monitoring. EMSAT’s software solution can relay information from the environmental parameters being monitored to the pod’s internal temperatures and the speed the turbine is spinning. Strategic partnerships with sensor providers and industry partners allow EMSAT to provide innovative end-to-end monitoring solutions. The ‘SAT’ in ‘EMSAT’ stands for ‘satellite’, and its inclusion in the company name was no chance occurrence. Satellites are necessary when operating in remote ocean environments, a key area of focus for EMSAT. The company is already engaged in a number of projects related to Arctic monitoring. Agile Sensor Technologies is also a new company and one of many examples of university-led R&D making its way out of the halls of academia and into commercialization. Agile was established in late 2014 to commercialize technologies developed during a Memorial University (MUN) project that was originally focused on the so-called “sense and avoid” problem for unmanned aerial vehicles – it evolved to include technologies for ocean application as well. “The MUN team’s approach to sense and avoid was to put intelligent sensors on the vehicle,” said Brian Terry, Agile President and CEO, adding that additional technologies were developed to improve the capabilities of the motion platforms that aimed the sensors. Led by MUN Faculty member Nicholas Krouglicof, now Agile’s VP of R&D, the research team set up a Mechatronics Development and Prototyping Facility on the MUN campus, capable of creating functioning mechatronic (mechanical and electronic) machines. The key technologies that have arisen from the MUN research and licensed to Agile are an intelligent camera with an embedded application that can be used for docking of autonomous underwater vehicles, a high-speed, high-accuracy pointing device and an aerial vehicle for inspection and other applications. The camera application has the potential to be a game-changer in cold, harsh and ice-prone environments like the Arctic, allowing Autonomous Underwater Vehicle (AUV) to remain underneath ice, docking on the seafloor to recharge, greatly extending their operational range. Developed originally for use with the intelligent camera, the pointing device is patentable subject matter in its own right, with many more potential applications, such as underwater laser scanning. Applications of the aerial vehicle include use in iceberg tracking and offshore platform facility inspection.